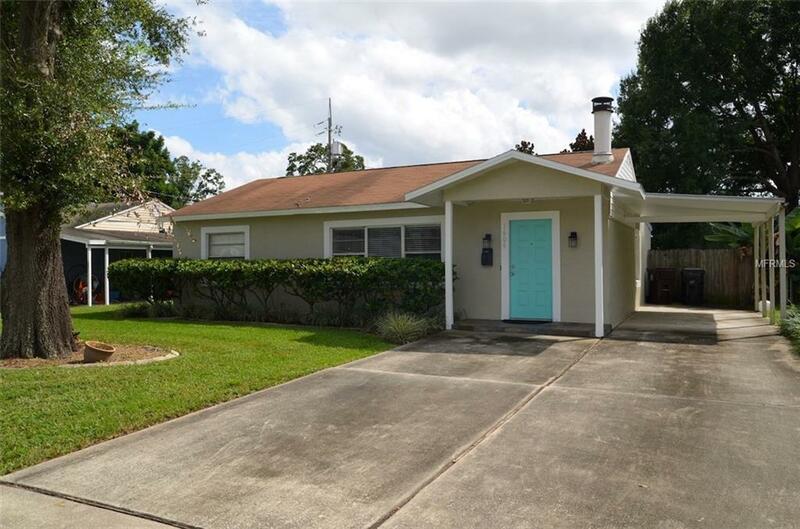 This is a cute and updated 3 bedroom/2 bath home in College Park located just off Edgewater Drive on a scenic street. This property features hardwood and ceramic tile flooring with carpet in bedrooms. The floor-plan includes a spacious living room with original hardwood flooring with wood burning fireplace. Just off the living room is the updated kitchen with dishwasher, stove, refrigerator and microwave and there is a dining area nook just off the kitchen. This property also features a family room/den with door leading to the back screened in patio. The master bedroom is just off the family room and includes a walk-in closet with built-in shelving for organization and storage. Off the living room there are two more bedrooms and a shared hall bath along with additional storage areas. Just off the kitchen there is a laundry/utility room with built- in storage shelves and closets along with a washer/dryer hookups with washer and dryer included. This property also features a screened in back patio, a deck area that includes a jacuzzi, a large storage shed and spacious fenced backyard, a large driveway with plenty of parking space including a covered carport area. Pets will be considered on a case by case basis. Proof of a renters insurance policy is required to rent this property. Call today for appointment to view this property. Pet Restrictions No Dangerous Breeds Or Mixes As Defined By Florida Insurance Companies. Listing provided courtesy of Fusilier Management Group.